When the fixed Volant no longer fulfils the requirements for low standing sunlight, the Vario Volant is the screen of choice. This vertical-roll volant repels the light of the setting summer sun and the blinding winter sun. The volant can be manually unwound up to 1.5 meters. All lengths and shapes are available. Also available in Soltis fabric. (Transparent cloth that is also used for Screens). 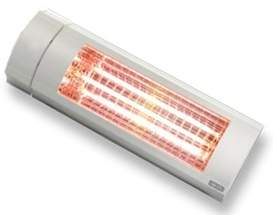 When the sun no longer warms your patio you can rely on our electric terrace heater. This modern, high efficiency terrace heater, allows you to enjoy the cooler summer evenings on your terrace. The dimmer function is used to set the desired temperature. (this can also be integrated into a single remote control). This stylish lighting element (5 x 20W spotlights) means you don’t have to worry when night falls and it gets darker. You can continue to enjoy your terrace without being forced to go inside due to lack of light. (can also be integrated into a single remote control). This side screen keeps sun and wind from the sides at bay as well as keeping prying eyes away from your terrace. 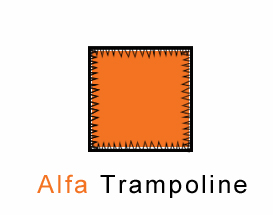 By using the hand-grip the screen can be vertically unwound up to 4 meters. Metal springs ensure that the cloth is always held under tension. Elegant design and a choice of all fabric colours. 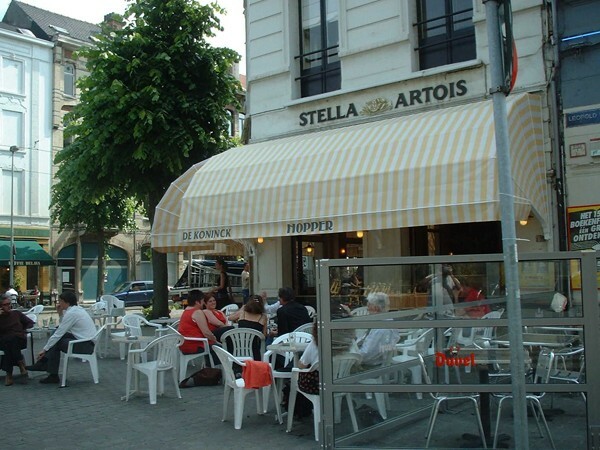 To reduce lateral light awnings can be fitted with side screens. All our products can be fitted with motors and automata. Do you want your shutter to come down at a fixed time? Or do you want the awning to roll up when there’s an unexpected gust of wind?Somfy hi-tech automata provide custom solutions for every situation. Existing awnings and shutters can also be fitted with these motors and automata. We use Somfy motors for the automation of all our products. 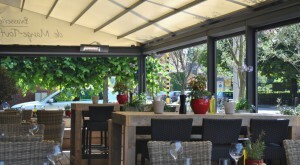 Various motor sizes are available depending on the size and span of the awning or shutter. Somfy motors are known for their durability and long life. Awning operation is done with a simple touch of a button. Both wall and remote control are available. The MY button allows you to program and save your preferences. The control can also be equipped with a timer function for optimum comfort. Somfy automata can control your blinds depending on the weather. The small wind mill is equipped with a sun sensor, and when a certain intensity is measured, the blinds go down automatically. When a sudden gust of wind picks up, the sunscreen, safely rolls back up. Thus, even when you are not present, it will never get too hot inside. 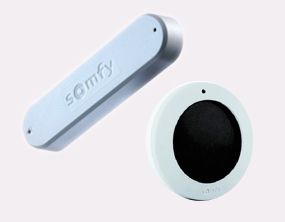 Somfy also has several autonomous sensors. These sensors require no wiring. 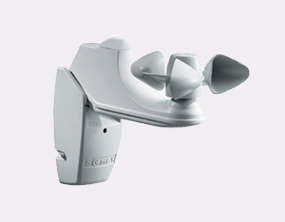 The EOLIS 3D is a wind detector, a rectangular box located in the front profile of the awning. The SUNIS is a sunlight detector. 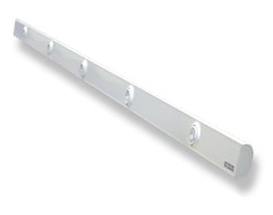 This can be placed on the outside wall/façade without the need for wiring. This machine generates its own energy from sunlight. Soltis fabric consists of polyester tissue which, after weaving, acquires a single coating (Soltis 86) or double coating (Soltis 92). Because the coating is applied later the canvas becomes very strong and has a high resistance to deformation. Soltis 86 offers the best transparency, while Soltis 92 has better heat deflection qualities. This type of cloth can be used for virtually any type of outdoor blind. Soltis fabric is available in a range of uni-colours. Up to 79% of sun-heat can be kept deflected by using these fabrics. The Alpha Select A is a sunscreen with an open frame. The folding arms are made of anodized aluminium with inbuilt springs. These springs keep the screen taut in all positions. The arms and wall supports are adjustable in relation to the support tube. 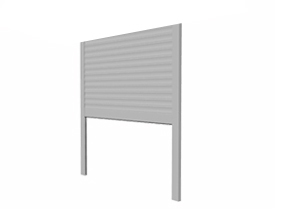 The fabric roller and support tube are of galvanized steel, and form a solid connection between wall and awning. The fabric roller is protected by an aluminium cover. A protective screen sleeve is available as an option. With built-in shield. The folding arms are made of anodized aluminium with inbuilt double springs. These springs keep the screen taut in all positions. The arms and wall supports are adjustable in relation to the support tube. 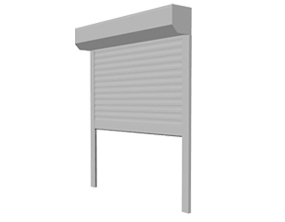 The fabric roller and support tube are of galvanized steel, which form a solid connection between wall and awning. The fabric roller is protected by an aluminium cover. A protective screen sleeve is available as an option. This is a variant of the Alpha Select B. This type overcomes the restrictive relationship between the width and span of the awning. A special articulated arm construction allows the arms to move over each other instead of alongside each other. This allows construction of an awning with a limited width but with a large span. 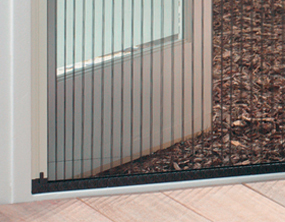 This screen is assembled in a protective anodized aluminium frame. The front profile closes off the front side of the frame completely. The folding arms are made of anodized aluminium with inbuilt double springs. These springs keep the screen taut in all positions. 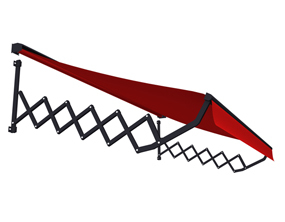 The arms and wall supports are adjustable in relation to the support tube. 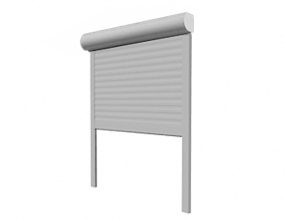 The fabric roller and support tube are of galvanized steel, which form a solid connection between wall and awning. The fabric roller is protected by an aluminium cover. A protective screen sleeve is provided as standard. This cassette design offers everything you would expect of a sunscreen in a compact and stylish design. The sunscreen offers a variety of mounting options, the compact design allowing mounting of the sunscreen at almost all angles. Wall mounting is adjustable up to 60° and ceiling mounting up to 90 °. The Karat is a self-supporting cassette screen with an elegant design. 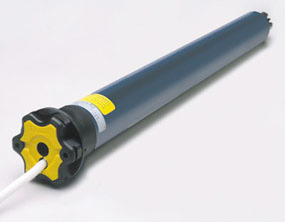 The fabric roller is wrapped in a special sleeve for optimal protection of the awning fabric. A standard drainpipe means the Karat is perfectly at home in the Belgian climate. The resurgence of the scissor arm screen is a fact. This solid classic can put up with a lot more than the average folding arm awning. The Alpha ® Retro is by far the most stylish awning in our range and gives your facade a unique retro style. The renewed design of this classic adds value to just about every facade, classic and modern. The maximum span of this screen is 500 cm. The Alfa Terrasol® is a movable sunscreen with 4 articulated arms that roll down both sides. This self-supporting design allows you to cover a large area. The freestanding awning can be easily moved around your terrace or garden. Installation is simple and you can set the screen angle yourself. The Terrasol ® is composed of cast aluminium parts, extruded aluminium screen profiles and galvanized steel support profiles. We use Somfy motors for the automation of all our products,. Various motor sizes are available depending on the size and span of the awning or shutter. Somfy motors are known for their durability and long life. Awning operation is done with a simple touch of a button. Both wall and remote control are available. 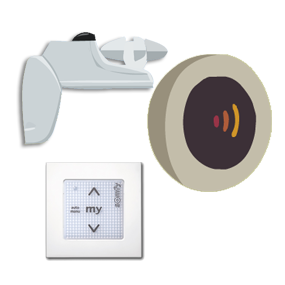 The MY button allows you to program and save your preferences. The control can also be equipped with a timer function for optimum comfort. 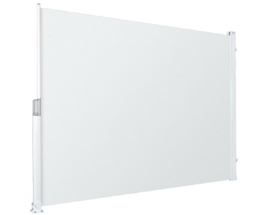 The banner is attached to the wall using two stylish stainless steel constructions. This construction has a durable tensioning mechanism to keep the banner taut at all times. The publifix is an obliquely placed billboard which doubles up to function as a sunscreen. The Rondo is a variation on the classic, the only difference being in the shutter frame. As the name suggests it has a rounded shutter frame. 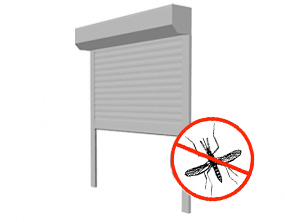 The minirol “Mosquito” is a standard shutter with built-in mosquito netting. The mosquito<br />netting is built into the shutter frame. There is no extra frame needed. The Minirol “Mosquito” is the solution for keeping mosquitoes out during the summer. Vertical awnings not only keep undesirable heat and light out, but also provides shadow for your terrace. Thanks to the waterproof awning material, the awning also provides protection against sudden downpours. 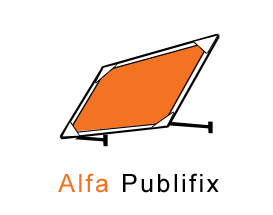 Alfa folding-arm awnings are of unprecedented quality. They are of a modular structure, are custom made in our factory, and can be manufactured up to 16 meters in length from a single piece. The choice of all RAL colours and numerous acrylic materials means the awnings can be tailor-made to suit your own tastes. As sun protection contributes to energy efficient housing, the purchase of an awning means you may be eligible for a grant. 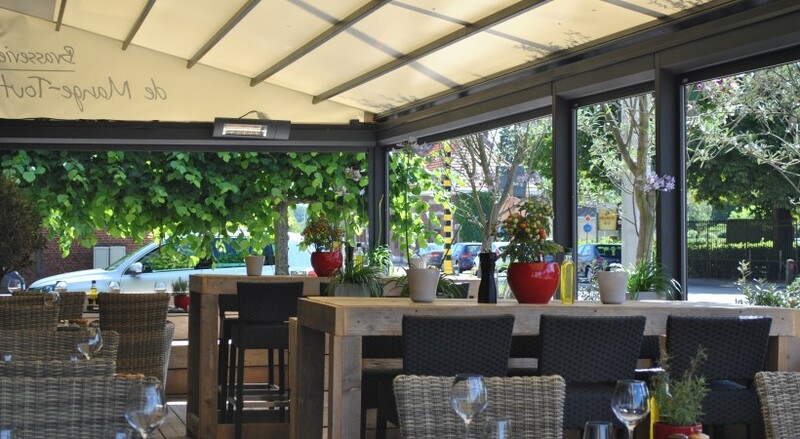 In addition to the outside awnings is Alfa a dealer of Luxaflex and Louverdrape products. All our products follow the latest trends in interiordesign and are available in all shapes and colors. Extra large sizes are possible. The Flex Colours collection includes a wide range of decorative and functional window covering products. The collections are divided into color groups and are conveniently arranged in several collectionbooks. They will inspire you when making your choice because the latest trends can be found in this collection. The Alfa-Marquis is the longest known and most effective form of sun protection. 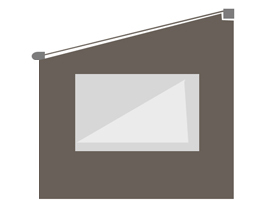 This form of fixed (not retractable) awnings is often closed along the side, which zoninval side of your windows are barred. Alpha offers a wide range of awnings to match almost every facade. For modern architecture, we include the Alfa and Alfa Deco Triangle. For typical, classical buildings you can choose Alfa Cannes or Alfa Christofle. Outside blinds help energy efficient housing, you can purchase your sunscreen expect a grant.